And just about nothing short of a miracle will change that. Heck, you might have even packed it in yourself by this point! Not that there’s anything wrong with that, per se. If Fridays felt anything like Mondays we’d all be tragic, miserable people. However, the reality is that when the sales quarter is speeding to a close and quotas are needing to be reached (or exceeded), finding a little extra productivity along the way can make the difference between finding yourself in good graces, or in the dog house. Sir. John Falstaff in his element. Remember: There are many important behaviors and practices that contribute to making a successful sale that may be less heralded than actually closing the deal. You can easily encourage important sales behaviors that might otherwise fall through the cracks by providing the right focus and incentives. If something like this doesn’t strike your fancy, there’s nothing wrong with turning to the old standbys like closing more sales or prospecting behaviors. It’s entirely up to you and your priorities. It would be best to run your “Falstaff Fridays” contest over the course of a month. That way there’s enough time to account for changing priorities or events that might come up, while keeping it short enough that you and your team don’t forget or lose interest. And during that month, remember to provide updates on progress and contest reminders. Easy. The team member that accumulates the most points wins THE PRIZE. There you have it, Falstaff Fridays. That’s what we in the biz call a win-win. Your sales team will be motivated to perform, and as a result, you’ll get the performance you really need, to help crush those demanding sales goals (and not to mention, a leisurely Friday afternoon at the Ale House to celebrate). Whether or not you decide to give this sales contest a go, the point here is to show that there are many creative and effective ways to incentivize important sales behaviors. 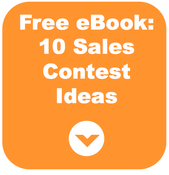 Hit us up with questions or contest ideas that work for you, and definitely download our eBook “10 Sales Contest Ideas That Work” for more great ideas to get the most out of your sales team. Fridays don't have to be a waste! Here's a fun Sales Motivation contest from LevelEleven to fix your friday.